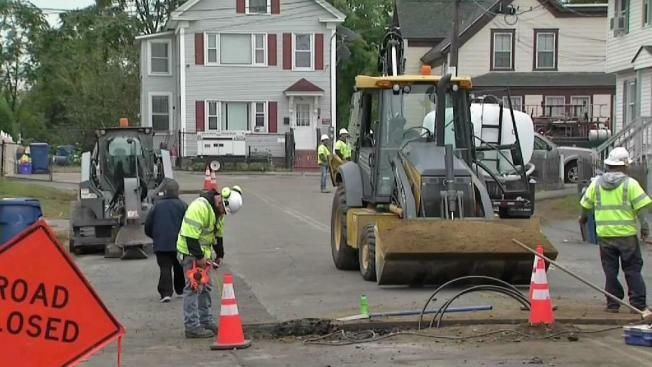 As temperatures continue to drop across the Merrimack Valley in Massachusetts, thousands of Columbia Gas customers left without heat and hot water after a series of explosions last month are trying to find ways to stay warm. The explosions across three communities on Sept. 13 resulted in the death of a Lawrence teenager and more than 20 other fire-related injuries. With dozens of homes and businesses damaged and left without gas, many people are struggling to stay warm. "Right now, it's getting to me," said Lori Martin of Lawrence. "Last night was really chilly in the house. It was probably like 48 inside my house." And Martin is not alone. "It's freezing. My house is freezing," said Lawrence resident Tere Santos, who said Columbia Gas put her on a waiting list for a hotel. "I just wish there was something closer than the [October] 21st, or something bigger because it is a one bedroom for four people." Santos, who lives with her husband and two young children, said the space heater she's been using isn't sufficient. "It's hard because when I move it from room to room while the other one is getting warm, then the other one gets cold," she said. Columbia Gas said Monday that a shelter that opened on Oct. 8 in the Malden Mills area of Lawrence is still empty. The shelter can accommodate as many as 1,000 people, if necessary. In addition to the shelter, Columbia Gas reserved more than 3,000 hotel rooms, rented more than 150 apartments and leased 360 new travel trailers. On Friday, the Massachusetts Department of Public Utilities ordered the utility company to impose a moratorium on all work other than emergency and compliance work across its entire territory at least until Dec. 1. The move came one day after the National Transportation Safety Board issued its preliminary report on the gas explosions. Columbia Gas said it aims to have gas service fully restored to the impacted residents by Nov. 19.